On the afternoon of Tuesday 9th April the choir responded to a request from the staff at the residential home in Carbis Bay to sing for the folks living there. A good number from the choir were able to attend. The atmosphere was very informal and afforded the opportunity to meet staff and residents and have a chat and cup of tea. Having recieved an email request via the choir website on 18th March, with residents reported to be rather low in spirit, this was indeed a quick response. How easy and heart warming it is to be able to make a difference in the lives of others. 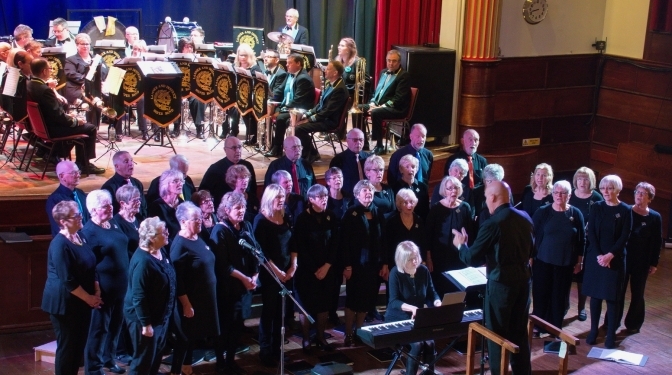 On the evening of Saturday 6th April the choir joined forces with the renowned Lanner & District Silver Band for a concert at The Guildhall in St Ives. A rather cold venue (the boiler had apparently broken down) was wonderfully warmed by a series of pieces from the band and choir, with several combining the two. This is the first time the choir have appeared with a band. Given that we are a community choir, where auditions are not required before joining, there was a degree of trepidation, knowing that we were performing alongside highly skilled and trained musicians. We need not have worried. It was an enlightening and enjoyable experience, much appreciated by the audience. The evening, which was in aid of the Stoke Association, was especially poignant for choir. One of our members recently suffered at the hands of this dreadful disease. A raffle was held to raise further funds. At the close, MC Janette Eathorne, who rendered several of her poems and threaded the occasion together with tall stories, was presented with a bouquet to round off the first concert of the year. A busy Christmas period for the St.Ives Community Choir (now in its 15th year), saw them raising yet more funds for various charities. During the year they have raised approximately £4,200, including £279.75 for the New Cornwall Air Ambulance fund at their annual Christmas Concert in a packed Carbis Bay Methodist Church . The choir were able to relax at their annual dinner, but the fund raising did not stop there, as through a raffle they raised a further £320 for the St.Ives Community Transport Minibus project for the over 50s. At a recent rehearsal for their 2019 programme, cheques were presented to representatives of the aforementioned charities. The picture shows Margaret Ford & Chris Muxlow (Community Transport) and Mark Adams (Cornwall Air Ambulance) receiving the cheques from the local Methodist minister, Revd Edwin Myers, on behalf of the choir and Chapel.